I'm about to let you in on a little beauty secret - and normally I can be coy about my beauty secrets, as my regular readers will know, but this one is too good not to share. "It happended again, Sarah. Last night - awake at 3am, then 5am, then 7am. Riley just won't sleep through the night. And when he gets home from daycare, he runs around the house until bedtime. I feel like I don't have any time for me anymore. I try and eat well but I don't always have time to eat the right foods, and it's starting to show on my face, my hair, my nails. It's just so hard to maintain my beauty regime with such a hectic life." Sarah nodded knowingly as I droned on and on about issues like my brittle nails. "Yep - I remember those days," she said. Then she smiled. "I've got just the thing for you." And she reached into her bag and plonked a bottle of vitamins in front of me: Blackmores Nails, Hair and Skin. "A comprehensive formula that provides essential nutrients for strong nails, healthy hair and skin," the label read. As I held the bottle in my hand, I breathed a sigh of relief. These three problems areas were exactly the ones I'd been worried about! 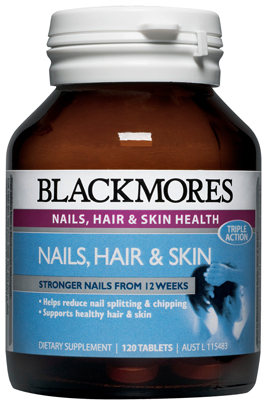 With ingredients like zinc, which maintains structural integrity of the nails, hair and skin, and vitamin C which is important in the production of collagen, Blackmores Nails, Hair and Skin contains nutrients which contribute to the health of nails, hair and skin. So I gave it a go - all it took was one tablet twice a day with meals. Twelve weeks later, I'm already noticing that my nails are starting to appear thicker and stronger! I have also been making a conscious effort to do things like wash my hair regularly, cleanse twice daily and eat good food. Us busy mums can't be perfect all the time - particularly when we have a little pocket rocket like Riley to take care of but with Blackmores Nails, Hair and Skin, I now know my nails, hair and skin are getting the attention they deseve.